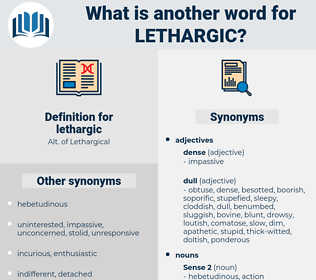 What is another word for lethargic? caring, alert, vital, vivacious, active, lively, animated, busy. industrious, merry, driving, brisk, assiduous, peppy, strenuous, hardworking, indefatigable, tireless, perky, spanking, diligent, snappy, unflagging, bouncing, unwearying, physical, zippy, dynamic, kinetic, rattling, springy, high-energy, sedulous, sprightly, occupied, working, engaged, canty. A strange lethargic calm seemed to have fallen upon Paul. He was roused with difficulty, and set about his work in a dull, unwilling, lethargic way, which promised badly for his tips from those he was supposed to serve. 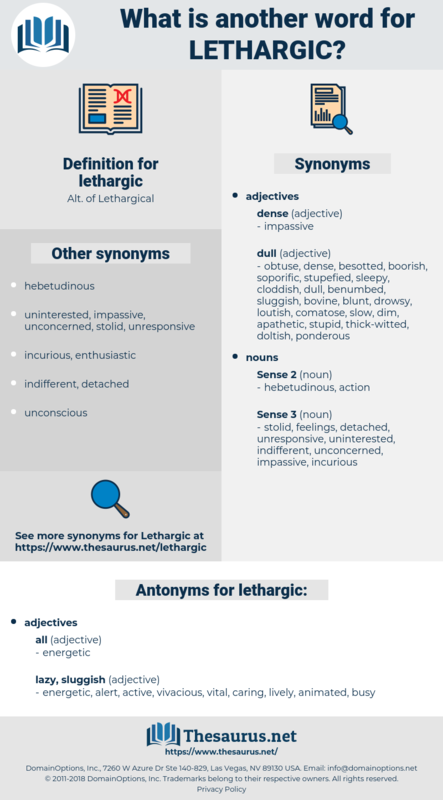 lythraceae, literacy, leatherjack, lethargy, letter c, letter g, letter k, letters, liturgics, leaders, letter j, letter case, leatherwork, lithuresis, liturgy, liatris, letter q, literary hack, lathyrus, letter z, letter s, literary work, letter x.